Opa and I spent October 8th through October 12th in the Carmel by the Sea area. We were there to spend time with Uncle Moses and Aunt Sitara. More than 500 cars were entered for the SCCA National Championship Runoffs (October 10-12), making it a thunderous nonstop three days of racing. Race fans were treated to twenty-seven different races, with each one crowning a national champion. Uncle Moses is the manufacturer of the Formula Mazda class. Fifteen Formula Mazda drivers competed in the 2014 SCCA National Championship Runoffs at Mazda Raceway Laguna Seca. The Formula Mazda podium consisted of winner Uncle Mike Anderson, second place Alan McCallum, and third place Stuart Rettie. Opa and Oma stayed at the Hofsas House. We love the fireplace in our room and that everything was in walking distance! This hotel has a Heated Swimming Pool, Continental Breakfast, and free Free Wireless DSL. There is plenty of parking and Oma love the fact that the room had really glass drinking cups and glasses! Although we did not have too much free time, we fit in a wine and chocolate tasting at De Tierra Vineyards; a family owned and sustainably operated winery. They have a limited production of estate grown Pinot Noir, Chardonnay, Syrah and Merlot. Everything was yummy. 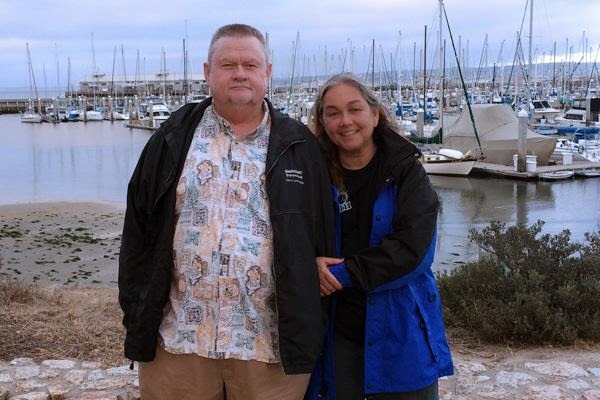 Our friends Dwayne and Judy introduced us to the Old Fisherman's Grotto on the Monterey, California Wharf. Very fancy yet affordable! Oma and Judy shared a Tiramisu desert which was delicious; 8 Italian custard made with mascarpone, vanilla sponge cake, marsala and espresso coffee and sprinkled with cocoa powder. However, my Lobster Chili at Flaherty’s Oyster Bar was the best. We stopped in for lunch and it was both quaint and friendly. Carmel has been a haven for artists and a refuge for writers and intellectuals who shaped this unique artist colony. Opa and Oma enjoyed a brisk walk while exploring a few of the nearly one hundred art galleries within a walkable one-square mile. Take a moment to enjoy the photo album below!